Last week there were so many excellent mommy resources and solutions shared- 126 to be exact. 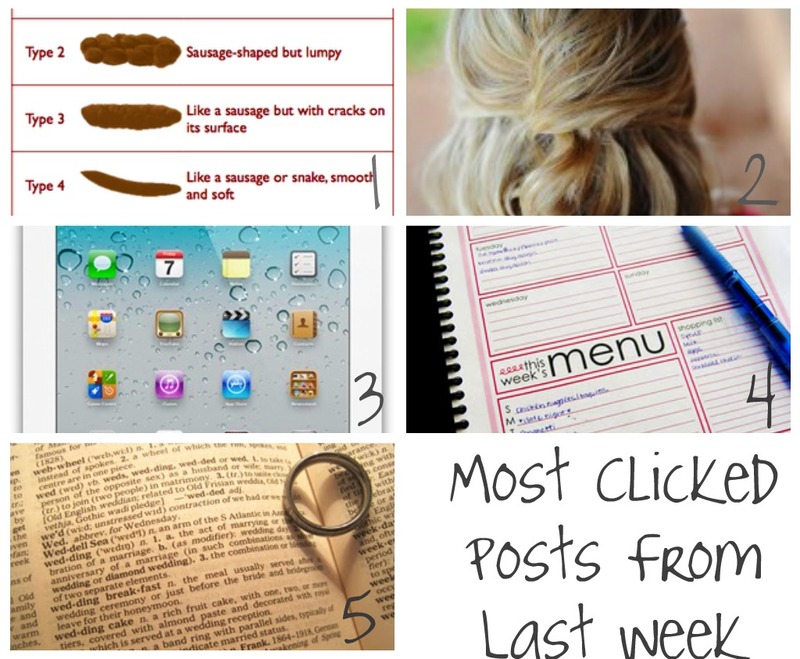 Here are the most clicked ideas from last week. Raising Dieter shared a stool chart with us that is very resourceful. I know it is a touchy topic, but we’re all moms. And I have many poop questions. I honestly found this chart very interesting. Glad she shared it. The Southern Product Queen shared her top ten posts from 2011. I love this half French hair twist. I wish I was more creative with my hair. Kids Activities Blog shared over 20 FREE educational apps for kids. So awesome! Artsy Fartsy Mama gave us a free menu planner printable. Perfect timing with our Simple Dinner Ideas series we having going on here at Crystal & Co. Whole Intentions shared the top 10 reasons for divorce. Sad but true. Weigh in on her site and leave a comment with your thoughts. Hop over to Milk and Cuddles and see what Shannon’s favorite three entries were from last week. Mommy Solutions on Crystal & Co. If you have any posts sharing tips about how to meal plan, you’ll want to be sure you link up and share them in the Simple Dinner Ideas series 3 Boys and a Dog and I are doing in 2012. This month our sponsor is Rada Cutlery. They have an amazing line of knives and other kitchen tools and accessories that are all budget friendly. Muvazi is our new Crystal & Co., sponsor. I have very sensitive skin and their anti aging skin care system will turn your skin around. I am three weeks into using their four step system and my skin feels amazing! I have a giveaway for a free skin care system valued at $119 AND I have a discount code for $50 off your purchase. Ok, it is your turn to share your solutions, resources, tips and ideas. Here is our badge if you want to place it in your post. I shared an article about lacto-fermentation. Also an interview with the author of \”Could It Be B12? \”. Jill@RealFoodForager.com recently posted..The Meat of B12 Deficiency: Interview with Sally M. Pacholok, R.N., B.S.N. Thanks for featuring the stool chart!